In Riviera Nayarit luxury is our nature, and this nature constantly invites visitors to adventure. 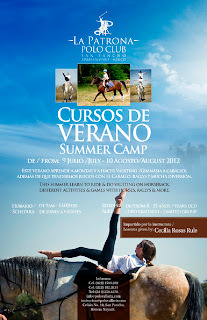 The summer in Mexico’s Pacific Treasure holds many surprises and unforgettable activities for the little ones, such as the Summer Horseback Riding Camp by La Patrona Polo Club in San Pancho, which will take place between July 9 and August 10, and can be enjoyed any time from one week to the whole month. Children will learn to ride on different types of saddles, and will learn how to make stunts, participate in rallies, travel on a wagon and will learn about horses and the care they need. The Summer Camp at La Patrona Polo Club will be led by vaulting expert Cecilia Rosas, and has been designed for children ages 8 – 15. The program includes extensive instruction, including how to bathe a horse, and will promote discipline among children. “Children will enjoy an experience that will change their lives through the wonderful contact with horses. They will learn how to ride naturally thanks to vaulting (gymnastics and exercises that are performed while riding). In Europe, this discipline is essential to learn to be in harmony with the horse and also helps to develop physical and social skills”, said the instructor. Riviera Nayarit’s beautiful beaches are the perfect setting to practice sports like surfing and kiteboarding, and always provide fun vacations for children. The Convention and Visitors Bureau (CVB) of Riviera Nayarit congratulates La Patrona Polo Club for contributing to the development of program that attract new tourists to our destination.